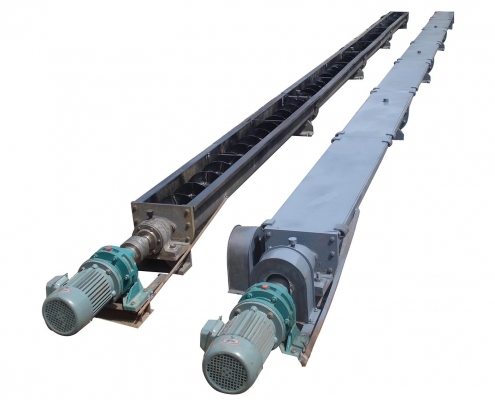 Compared with other transmission equipment, screw conveyor has the characters of small entire machine section, good sealing performance, stable operation, available middle muti-point feeding and discharging, safe operation and convenient maintenance. The equipment is suitable to convey powdery materials, practical materials, and small block materials, which has been widely used in material building, metallurgy, chemical, power, coal, machinery, and grain and food industry. It is not suitable to convey perishable materials, very cohesive coking materials. Please specify the specification, form, type and features of conveyed materials when placing order. 1.The middle bearing adopts rolling and slipping exchange structure with advantages of good sealing and wearing resistance. 2.Suspension bearing adopts machine outside oil cup, which is convenient for lubricating. 3. The new added electric discharge hole is convenient for automatic controlling.